On display in the museum's Legacy Building are three tapestries dedicated to Dr. King and the American Civil Rights Movement. The pieces are sponsored by U2 artists Bono and The Edge along with musician Sting, formerly of The Police. They were designed by award-winning, Czech-American artist, Peter Sís, and woven by French master weavers of Ateliers Pinton. The project was conceived by Bill Shipley, an Irish human rights activist and founder of Art of Amnesty, Amnesty International’s global artist engagement program. Since 2012, the program has created work to honor human rights activists including Czech Republic dissident and playwright Vaclav Havel, Irish poet Seamus Heaney, Beatles songwriter John Lennon, and South African leader Nelson Mandela. The Civil Rights Tapestries project began in 2016 with illustrations by Peter Sís, editorial cartoonist and children’s book illustrator, whose work is recognized by the New York Times, Boston Globe and the International Board on Books for Young People, the highest recognition for children’s book illustrators. Sís designed Give Us the Ballot, Freedom Ride and I Am A Man to honor Dr. King and thousands who stood for civil rights in the 1950s and 60s. The 7’ wide x 10’ tall mural tapestries were created by master weavers of Ateliers Pinton, a legendary textile business established 150 years ago in Felletin-Aubusson, France which has made tapestries for Picasso, Delauney, Miro and more recently, Calder, Botero and Milhazes. 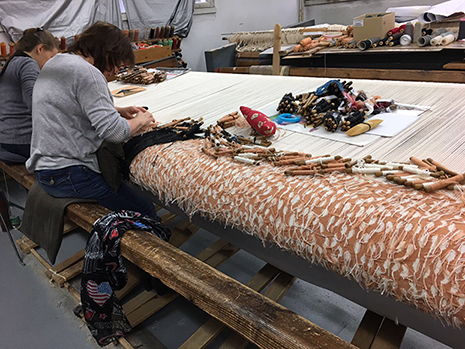 The handmade pieces took over 3,000 hours to complete using the basse lisse method recognized by UNESCO as an Intangible Cultural Heritage of Humanity. The pieces will show at the museum until December 15. After resting, each of the tapestries will be donated separately to the permanent collections of the National Civil Rights Museum (I Am A Man), the Birmingham Civil Rights Institute (Freedom Ride) and to the City of Atlanta (Give Us the Ballot).